I agree with Spyros, I have a lot of friends (real ones almost entirely) on Facebook but I don't spend nearly enough time there to keep up with all the stuff they post. And the Facebook applications mostly drive me mad with their inane and persistent in-your-faceness. I always click the 'Ignore this request' button with a slightly guilty feeling of having 'jilted' someone I care about. And I agree with his remarks about Twitter too. It took me a long, long time to understand it, but now that I do I'm beginning to appreciate it. I also use Friendfeed - a lot. If you want to see how, just visit my stream. You'll notice it contains posts from Twitter, Delicious, Moblog and many more. All of them are added automatically whenever I post to those sites. And when I write an item on my blog Friendfeed picks that up and adds it for me too along with all those other sources. And I can fill in my 'status' on Friendfeed just as I would on Facebook or Twitter. All the output from Friendfeed can appear in Facebook, Twitter, and anywhere else I like without me lifting a finger or striking a key. I love it! It's well worth a try. Like Twitter it's really simple and very easy to use. Today is a turning point for Iran. Either there will be a change of direction as Supreme Leader Ayatollah Ali Khamenei backs down and is, perhaps, replaced by the Assembly of Experts; or more likely he will continue along the path he's chosen and will try to stifle the opposition and return to some semblance of the repressed normality that has been Iran for so many years. If he does continue to threaten violence and pretends to pin the blame on the opposition, there could be a rapid growth of upheaval and things would then become extremely unpredictable. So, if there is violence, who will really be responsible for it? When a member of the Basij points a gun at unarmed people in a crowd and fires indiscriminately, fear has become cowardice and the responsibility for injury or death lies with the one who fired the weapon. To say that peaceful disobedience to the Supreme Leader shifts the blame for violence onto the crowd or onto Mr Mousavi is a strange argument. Surely it is an argument rooted in fear and desperation! If you strike me or shoot me or burn my house it's my fault, not yours? I don't think so! Responsibility lies with the one who pulls the trigger and with those who give the orders to do so or try to justify such an act in advance. 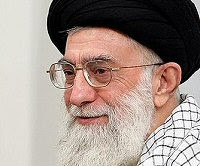 Ali Khamenei is no more a Supreme Leader than I am! The very title is an affront to the Most High in heaven for he alone is Supreme Leader over Iran, the entire world, and indeed the Universe. It does not befit men or women to act as leader because there is One who has true authority. The Koran instructs its readers to also read the Injil (the gospel), and there every seeker of truth will find Isa (Jesus) who said, 'I am the way, the truth, and the life'. He is King, he is the Great Shepherd of the sheep. No mortal man or woman has a heart great enough, a mind wise enough, a spirit true enough, or an ego humble enough to be a Supreme Leader. No, not one! And we also know that every single one of us has sinned. Let no one stand against the Most High, for he alone has the true authority and power over the lives of men. He will have his way, better not to stand in his path for he will sweep aside everyone who opposes him. What did Isa say about the law? He said that to love the Most High and to love the people around us (even if they are our enemies) is the fulfillment of the entire law. How can anyone do harm to those they love? This is a turning point for Iran, a turning forward or a turning back. It could be a disaster or it could be a wellspring of hope. Time will tell.